IRM’s LightfootTM is ideally suited to working on all sorts of restoration forestry projects. 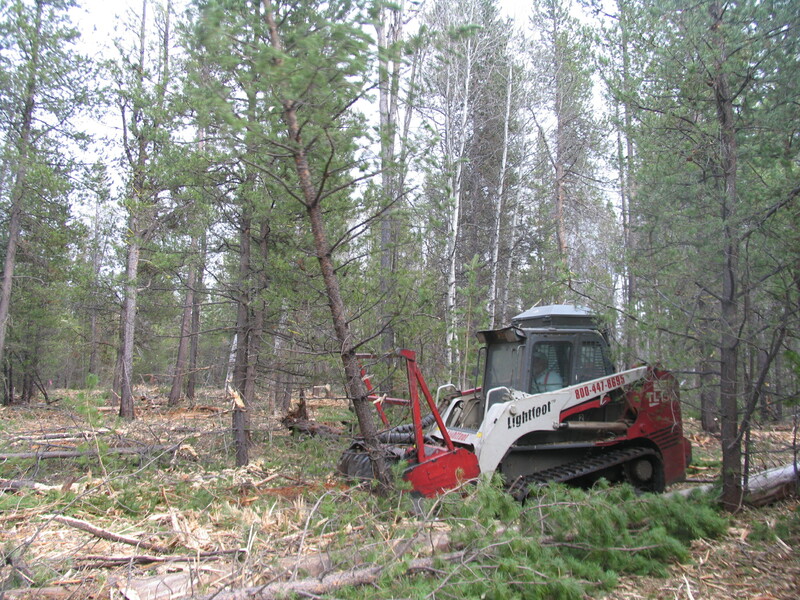 LightfootTM can brush mow noxious weeds and small diameter trees without causing site disturbance; pile slash, wood debris and small diameter wood and shear trees 14″ or less in diameter. Lightfoot brush mowing noxious blackberry. Lightfoot shearing dense ponderosa pine. 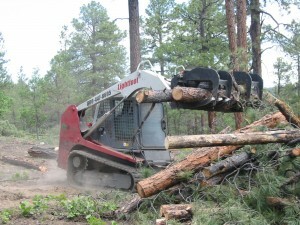 Lightfoot piling pine with Grapple. LightfootTM and its implements can be transported anywhere with our Chevy Kodiak commercial heavy use truck and utility trailer. IRM operators clean the LightfootTM after every job to avoid the spreading of noxious weeds. 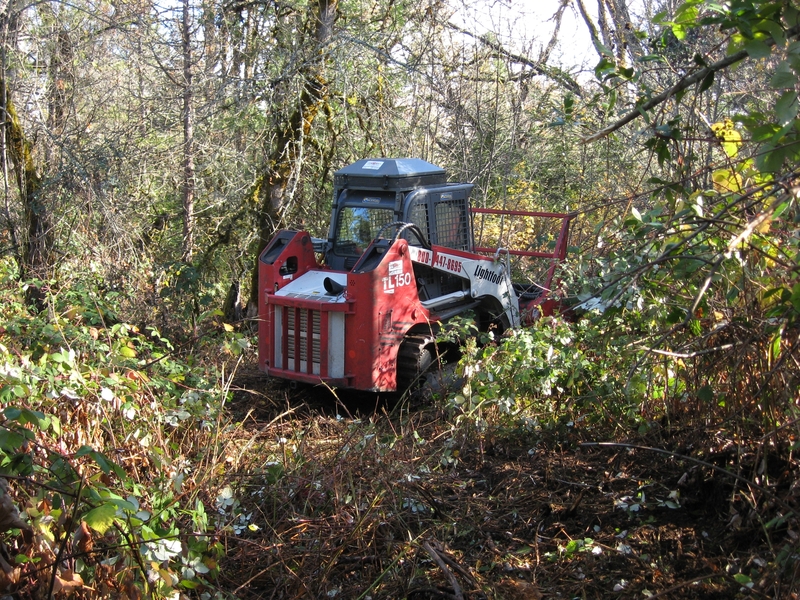 Scope: The photos and video clips below show the LighfootTM working within the Wildland Urban Interface near Sutherlin, Oregon. 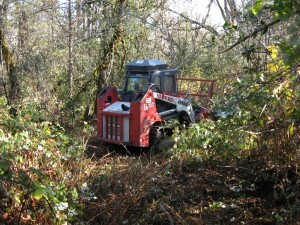 The LightfootTM was mounted with the Fecon Bullhog® and was used to reclaim a 35 acre pasture which had been invaded by scotch broom. The scotch broom was over 10′ tall and covered over 95% of the field. Subsequent treatment will involve the application of Garlon 3A to treat the stumps and eradicate the weed. Due to its low ground pressure and minimal disturbance characteristics (as a result of its rubber tracks), the seed bank of scotch broom was not disturbed, and virtually no germination of seed has occurred in the field. 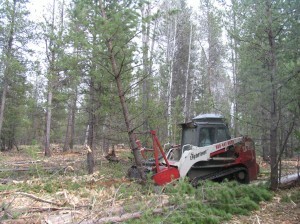 Please click on the links below to see specific project examples of LightfootTM in action and the positive results it can have on forest growth and productivity, as wells as habitat restoration.